В июле 1923 года взлетел автожир С.5 с аналогичным мотором и трехлопастным несущим винтом. После этого Сиерва, ранее финансировавший свои работы из частных источников, получил субсидии от правительства Испании. Его следующая ДальшеMore>>> модель С.6 стала началом серии удачных автожиров - так назвал Сиерва свои конструкции. Этот термин должен был использоваться только для машин Сиервы и обладателей его лицензий. Автожир С.6А с фюзеляжем биплана Avro Type 504K и ротативным мотором Rhone 9Ja взлетел в мае 1924 года. На лонжеронах консольной балки были установлены элероны. Четырехлопастный несущий винт диаметром 10,97 м имел горизонтальные шарниры. При помощи троса его можно было раскрутить на земле до 60 обор/мин, таким образом, укорачивая разбег при взлете. Подъем машины в воздух происходил при достижении скорости вращения винта в 140 об/мин. Первый полет автожира состоялся 12 декабря 1924 года на расстояние 12 км между двумя аэродромами Мадрида - Куатро Вьентос и Хетафе. Был также создан автожир С.6В с аналогичным мотором. В октябре 1925 года Сиерва привез аппарат С.6А в Британию по приглашению директора научных исследований Министерства авиации. После демонстраций в испытательном центре в Фарнборо Министерство заказало несколько автожиров для оценки в британских ВВС. Контракт на их изготовление отдали фирме "A.V. Roe". Обозначения Avro Type 574 и Type 575 присвоили аппаратам Cierva С.6С и C.6D. Каждый из них оснащался ротативным мотором Clerget мощностью 130 л. с. (97 кВт). Первым взлетел С.6С 19 июня 1926 года, 29 июля взлетел и C.6D. С.6С разбился в аварии в январе 1927-го, когда лопасть несущего винта оторвалась на высоте 37 м, но пилот почти не пострадал. C.6D стал первым двухместным автожиром. В сентябре его облетал в Берлине Эрнст Удет. Этот аппарат Avro Rota Mk I состоял в 1943-1944 годах в британской 529-й эскадрилье. Он использовался, главным образом, для калибровки береговых РЛС. В боевых действиях не участвовал, хотя и был практически неуязвим для вражеских истребителей благодаря своей исключительно высокой маневренности. Обозначение С.7 присвоили двум автожирам Сиервы, построенным в Испании Хорхе Лорингом и полетевшим в 1926 году. Аппарат С.7 имел V-образный мотор Hispano-Suiza мощностью 300 л.с. (224 кВт). Его показали на авиашоу в Мадриде. ALTHOUGH it cannot be regarded as an entirely new machine, a description and illustration of it having been published in FLIGHT more than two years ago, the de la Cierva "Autogiro" which was demonstrated over Laffan's Plain on Monday of this week, October 19, incorporates some principles not hitherto applied to flying machines. Reports of flights with this machine have reached this country from Spain from time to time, but it is one thing reading rather vague reports of flights with a new type, and quite a different thing actually to witness such flights. It was therefore with a good deal of eagerness that one proceeded to Farnborough on Monday to see Capt. Frank Courtney fly the "Autogiro" at the Royal Aircraft Establishment. In order to make sure of arriving in good time we took an earlier train than that which had been described by the Air Ministry as "suitable," and arrived at Farnborough shortly after 10 a.m. Knowing his apparently inexhaustible energy, one was not in the least surprised to discover that the Director of Civil Aviation, Air Vice-Marshal Sir W. Sefton Brancker, had also decided upon an early start, and the small party was soon within the sacred precincts of the R.A.E., where a visitors' book was duly signed, credentials presented and other small formalities seen to. It was discovered that the "Autogiro" was out in the middle of the aerodrome, and what was worse, was being towed slowly but with maddening persistency farther and farther away in the general direction of Laffan's Plain. One waited for Sir Sefton to give a hint as to what was the proper procedure under the circumstances, and had a few momentary, although as it proved, futile, visions of a conveyance heading Laffan-wards. But the D. of C.A. scorned such modern aids to locomotion and set off hot-foot (at first) in pursuit of four curious flapping wings discernible in the dim distance. The small party had not gone far before experiencing how abominably wet the grass on Laffan's Piain can be, and the guess was ventured that this, was a special kind of R.A.E. experimental grass, specially produced to dissuade curious onlookers from trespassing on the sacred ground over which all our hush-hush machines make their first secret flights. 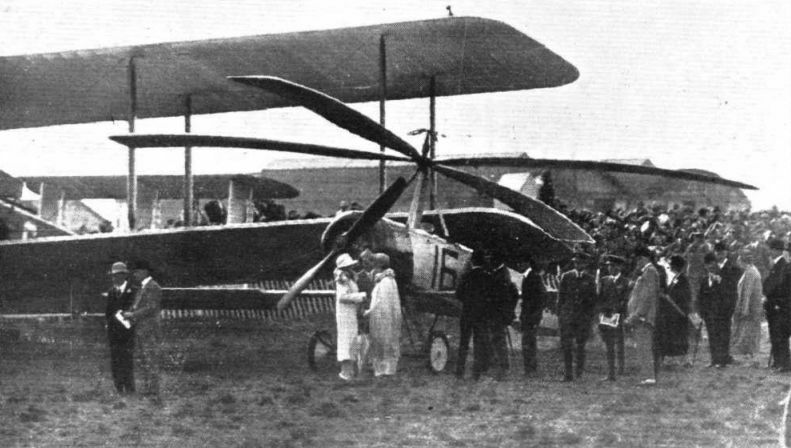 On this occasion there was only a large single-engined biplane fitted with a Rolls-Royce air-cooled "Vulture" engine, and Leitner-Watts all-wood propeller on the ground, and as the engine was idling over, it was suggested that this was done to prevent visitors from seeing the secret propeller. Finally, the "Autogiro" came to a standstill opposite the pavilion on the Plain, and our party slowly approached it, all blessing the very wet wetness of the grass in hearty undertones. All except Sir Sefton Brancker that is. The Director of Civil Aviation looked as if he always walked three miles in wet grass after breakfast, and if his indifference was not genuine it was splendidly simulated. On reaching the "Autogiro" a detailed inspection was at once commenced, and owing to the utter simplicity of the mechanism, it did not take long to master the details, as far as the working gear was concerned. 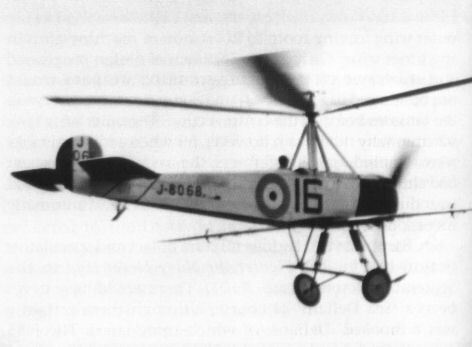 The "Autogiro" portion, of the machine consisted of four wings, single-spar affairs, pivoted around horizontal hinges to a steel tube pillar rising from the fuselage. Near the top of this pillar were substantial shackles holding short lengths of rubber cord, which prevented the wings from drooping below a certain level. Just below the shackles were a couple of ball thrust bearings and that seemed to be about all. The rest of the curious bird was an Avro 504K fuselage with normal tail, a le Rhone rotary engine, and a more or less normal Avro undercarriage. Apparently in order to avoid a too violent departure from normal, a couple of spars projected laterally from the fuselage, each carrying a fairly large aileron. It was later learned that these served mainly to cheer up the pilot and were in no way necessary. Almost as soon as the inspection of the machine was completed, Mr. Courtney and Senor de la Cierva arrived, and one was able to ask questions concerning such points as were less obvious from an examination of the machine. Thus it was ascertained that the overall span of the "Autogiro" is in the neighbourhood of 36 ft., while the mean chord of the wings is 2 ft. 7 in., and the area of each wing approximately 40 sq. ft. (a total of 160 sq. ft. in all). At full speed the windmill lifting surfaces revolve at something like 140 r.p.m., or about 2-3 revs, per second. At first this speed appears to be very low, until a rapid estimate indicates that it actually means a tip speed of about 260 ft. per second, or 180 miles per hour. That having been realised, one begins to understand whence the "Autogiro" obtains its lift. Although the official demonstration flight was timed to take place at 12 o'clock, Mr. Courtney decided to make a trial flight, and the two Spanish mechanics consequently commenced to "wind up" the windmill. This process is necessary at present in order to reduce the length of run required for the machine to take off. As soon as the whole of the cable had been wound off the wood blocks on the wings, Courtney opened out his engine and the machine commenced to taxi. 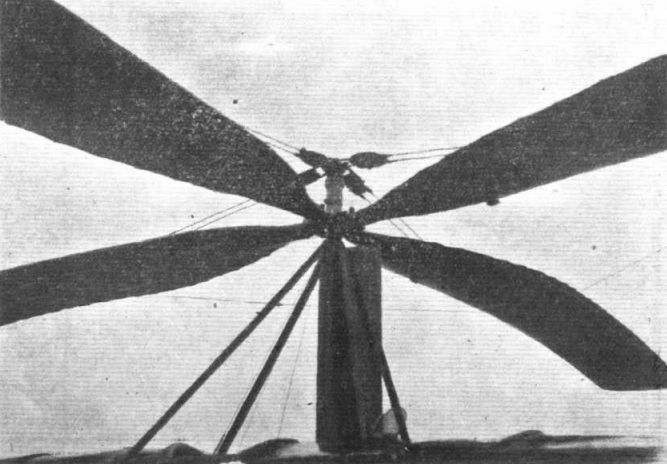 It was noticed that after running some distance along the ground the wings commenced to rise at a relatively pronounced angle, this evidently being caused by the action of the lift on the wings before they had reached sufficient speed for centrifugal force to bring them back to the horizontal. 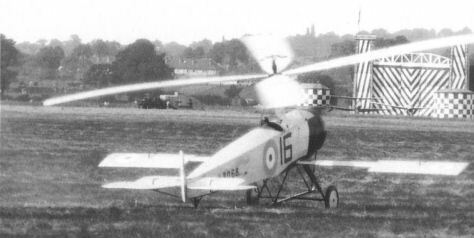 As the machine ran along the ground the windmill gathered speed, and after a run of approximately the normal required by the standard Avro, the "Autogiro" rose slowly into the air. Courtney made several turns to right and left, showing that the machine was under perfect control, and finally he came in and landed. Approaching the aerodrome at what appeared a fairly normal angle, he carried on until about 50 or 60 ft. up, when he pulled back the stick. The tail of the machine dropped, and a descent was commenced which seemed to be very nearly vertical. Actually we believe the horizontal speed at the time was between 10 and 15 m.p.h. The machine touched the ground, ran a distance of rather less than its own length, and came to rest, the windmill continuing to rotate for quite a long period afterwards. 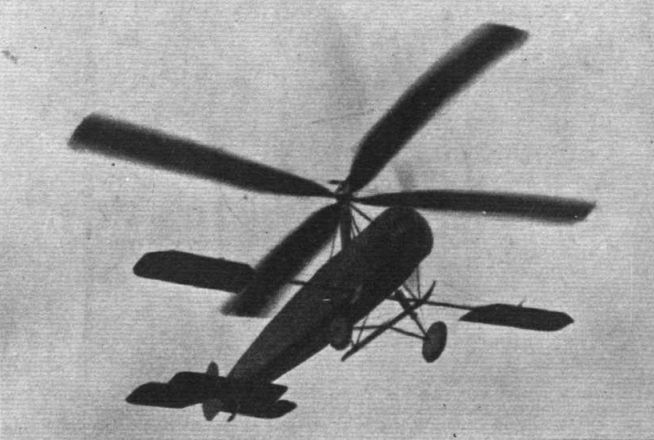 From the short flight it was perfectly obvious that in the "Autogiro" one has a machine which is capable of flying horizontally under perfect control; is able, if desired, to glide down at about the normal angle for an ordinary machine, or is capable of descending at a very low horizontal velocity indeed. Throughout the machine was evidently under perfect control and showed no tendency to "stall" in the ordinary sense of the term. Actually, when descending in a nearly vertical flight path, the rotating wings are, of course, following a helical path so that, although the machine itself is descending almost vertically, the lifting surfaces are actually gliding at fairly high speed, the only difference being that they follow a helical path while the machine itself follows a straight one. 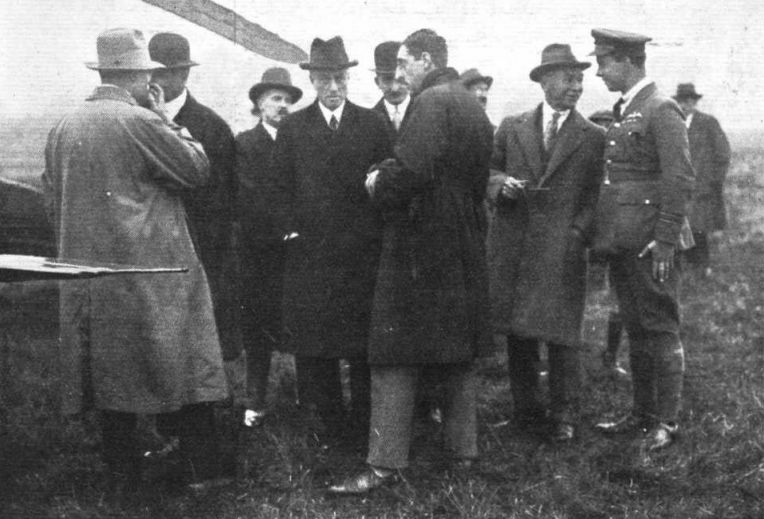 Shortly after the conclusion of the test flight a very distinguished party arrived, including the Secretary of State for Air, Sir Samuel Hoare; the Chief of the Air Staff, Air Chief-Marshal Sir Hugh Trenchard; the Air Member for Supply and Research, Air Vice-Marshal Sir Geoffrey Salmond, and a number of other officials prominent in Government aviation circles, conducted by Mr. W. Sydney Smith, Superintendent of the Royal Aircraft Establishment at Farnborough. Capt. Courtney and Senor de La Cierva briefly explained the principle of the "Autogiro" to an interested assembly, and Capt. Courtney then made several flights on the machine. On one occasion he came down in a very steep glide from about 600 ft , flattening out about 100 ft from the ground, and flying off again without landing. Throughout the machine appeared to be under perfect control. The action of the "Autogiro" has already been described in FLIGHT, but a brief outline may be of assistance, and may serve to fix ideas. 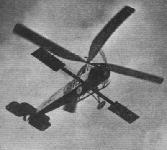 The "Autogiro" is, in effect, a four-bladed airscrew mounted on an approximately vertical shaft, and having its blades pivoted around horizontal axes on this shaft. This "windmill" is not geared to the engine in any way, but is caused to rotate slowly by the air forces acting upon it. Perhaps the best way of realising the reason for its rotation is to picture the "windmill" as being stationary, while the machine is travelling forward. Disregarding for the moment the two blades which are in a fore and aft position, it will be obvious that the starboard blade is meeting the air leading edge foremost (the direction of rotation being anticlockwise when viewing the windmill from above), while the port blade is meeting the air trailing edge foremost. The resistance of the blade travelling leading edge foremost is smaller than that of the blade travelling trailing edge foremost, with the result that the windmill begins to rotate. This, very briefly, is the principle of the "Autogiro." A number of interesting problems naturally arise, but with these doubtless the inventor, Senor de la Cierva, will deal in the paper which he is reading tonight before the Royal Aeronautical Society. Cierva C.6 reproduction, built in 1992 for the Seville Exhibition. The C.6A as demonstrated by Frank Courtney at Farnborough in 1925. 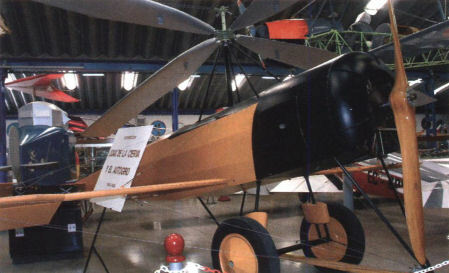 The "Autogiro" (130 h.p. Clerget) The invention of a Spanish engineer, Senor de la Cierva, the "Autogiro," which will be seen at Hendon has been constructed in this country by A. V. Roe & Co., it being perhaps significant that Mr. A. V. Roe, one of the earliest pioneers of British aviation should pioneer a modern venture. 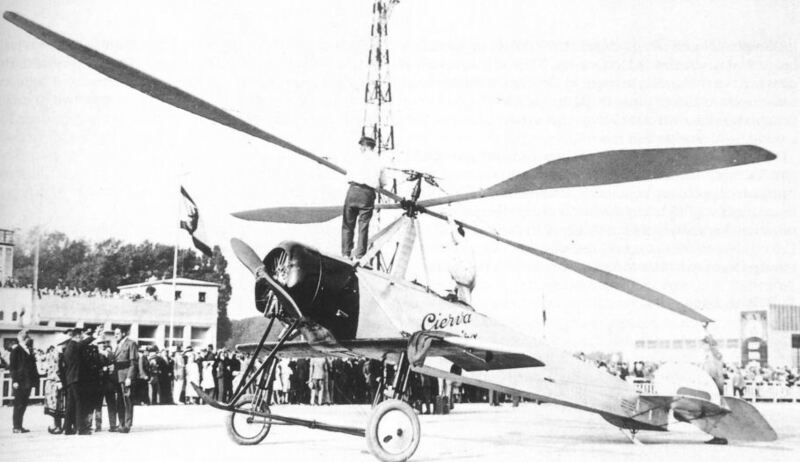 The "Autogiro" has a rotating windmill in place of wings, and differs from the helicopter in that the lifting surfaces are not driven directly by the engine but by the air forces acting upon them. Propulsion is by an ordinary airscrew. At present the "windmill" is hand started but later mechanical starting will be fitted. 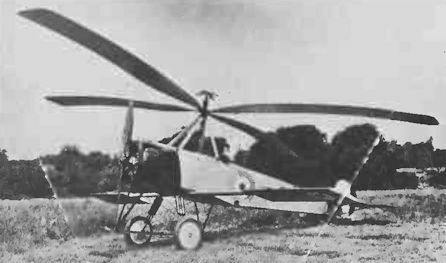 THE CIERVA "AUTOGIRO": Front view. A mechanic may be seen winding the starting cable around its supports on the wings. 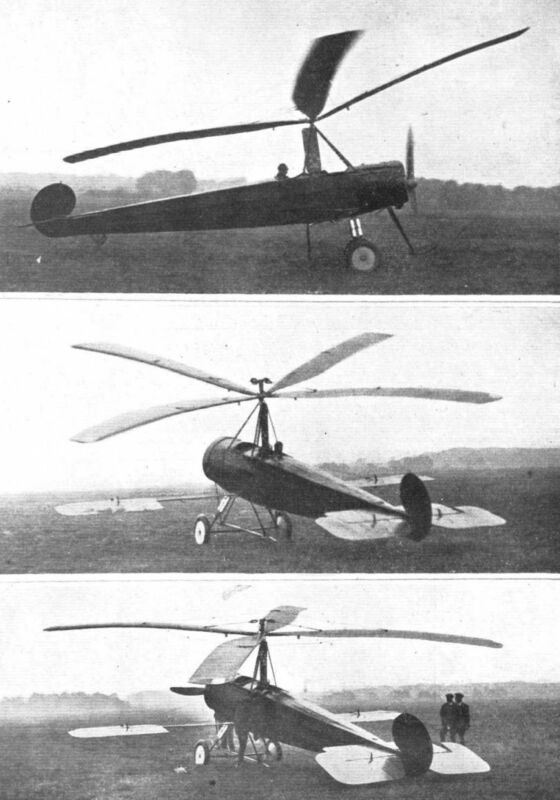 THE CIERVA "AUTOGIRO": These three views show admirably the action of the four-bladed lifting screw or windmill. In the lower view the machine is at rest on the ground, and the wings are drooping slightly.Above, the windmill has been started by means of a cable and has acquired a certain amount of speed, the the machine having just started its run. In the top photograph, the machine is seen shortly before "unsticking," the lifting planes having started to rise under the action of the lift. This is particularly noticeable in the wing pointing forward in the first photograph. 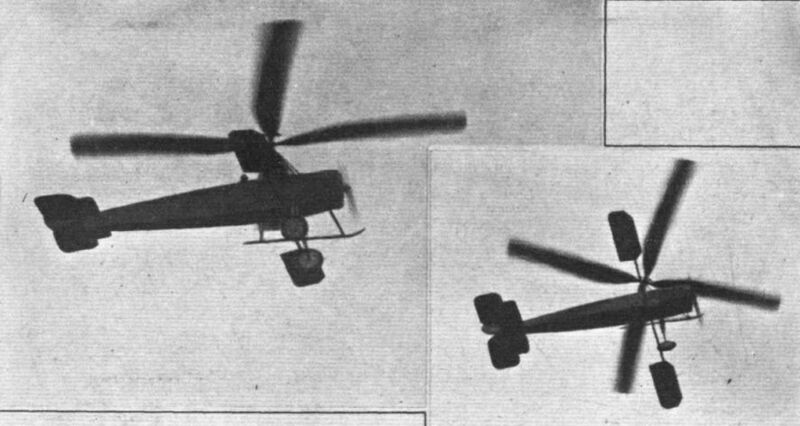 THE "AUTOGIRO": Two views of the machine in flight. Note how the high tip speed of the windmill beat our photographer. The "Autogiro," piloted by Capt. Courtney, making an almost vertical descent. A "STAR TURN" AT THE R.A.F. DISPLAY: The extraordinary Cierva "Autogyro" making one of its remarkable vertical descents. ROYALTY INSPECTS THE MACHINE PARK AT THE R.A.F. DISPLAY: The centre of interest is the Autogyro. In this group will be seen the King and Queen, King Alfonso and the Queen of Spain, the Duke of York, Sir Geoffrey Salmond, Sir Hugh Trenchard and Sen. Cierva. C.6C J8068 demonstrating at the Hendon Air Pageant, 1926. Pleasant view of Cierva C.6C J8068 (complete with 'New Type Park; number 16) performing at Hendon, 1936. The C.6D at Tempelhof in September 1926. The "Autogiro": A close-up view of the supporting mast, hinges and rubber cord top bracing which prevents the wings from drooping. THE CIERVA "AUTOGIRO": This photograph shows Capt. 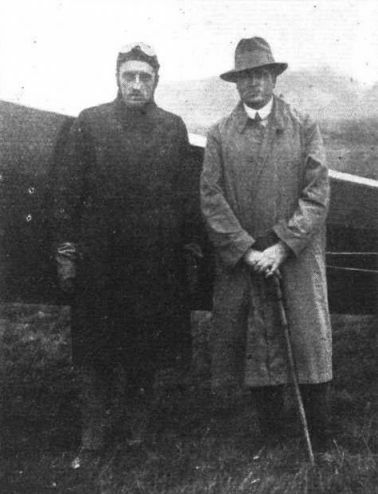 Frank Courtney, the pilot of the machine, and Senor de la Cierva, its designer. 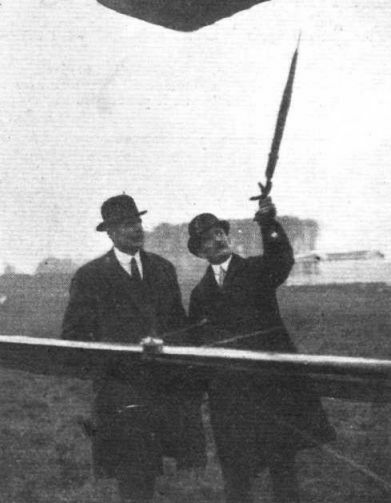 THE "AUTOGIRO": Air Vice-Marshal Sir Geoffrey Salmond explaining the principle upon which the machine works to Air Chief Marshal Sir Hugh Trenchard. THE "AUTOGIRO" DEMONSTRATION: Our group includes, from left to right, Senor J. de la Cierva, the inventor of the "Autogiro," Air Chief-Marshal Sir Hugh Trenchard, Chief of the Air Staff, Mr. C. LI. Bullock, Private Secretary of the Air Minister, Sir Samuel Hoare, Secretary of State for Air, Air Vice-Marshal Sir Geoffrey Salmond, Air Member for Supply and Research, Capt. Frank Courtney, pilot of the "Autogiro," Air Vice-Marshal Sir Sefton Brancker, Director of Civil Aviation, Mr. W. Sydney Smith, Superintendent of the Royal Aircraft Establishment, and Squadron Leader Rollo Haig. Not the best of images, but a view of Courtney's Worthy Down accdent. Note the wings.